Dear Giantmonk, When I was about 7 years old I had a conversation with my father. We were debating where the seaside was, which we were due to visit that day. Upon enquiring, my father replied with a simple ‘it’s by the beach’. Undeterred I asked where the beach was. He simply replied ‘It’s by the sea’. On the conversation went for quite some time until one of the two of us grew tired. 27 years later I can’t quite remember who! Anyway, for the last 27 years I have been pondering that very question… Is the sea near the beach, or is the beach near the sea? I do hope you can help me resolve this one Giantmonk, so that I can move on with my life and put this one to bed. Thank you in advance Kat (of the Canals) p.s. I really like your amazing website, witty personality and delectable style! Dearest Kat, your own style and wit are also both charming and delectable, and I can hardly believe that you have had a question revisit you for 27 years: that must be a typing error as you look in no way old enough for that to be the case. However long the period of time might be, let me answer plainly: the beach is by the sea. My reasoning is as follows: A beach is formed by deposits of various forms of sediment material, mostly land mineral in origin, often comprising bits of hard organic matter such as shells of sea creatures. The wave movement of the sea and tides causes this material to move over time and build up areas of deposits which we call a beach, whether it be of sand, shingles or pebbles, etc. Without the sea (or occasionally other body of water such as a river) to move the sediment into place then there would never be the creative power to form the beach. The beach is near the sea because the sea was there before the beach existed – the beach moved in to residence later. So, ignore Dean Martin – he was wrong – the lazy ocean does not hug the shore, the shore moved in to give the ocean a big friendly cuddle. 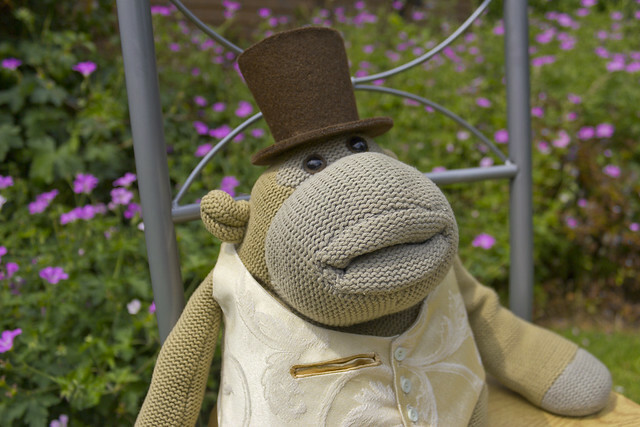 Today I took receipt of my outfit for Russell & Mimi’s wedding and with excitement finally got chance to try on my handmade waistcoat and top hat for that very special occasion that is happening in under three weeks. 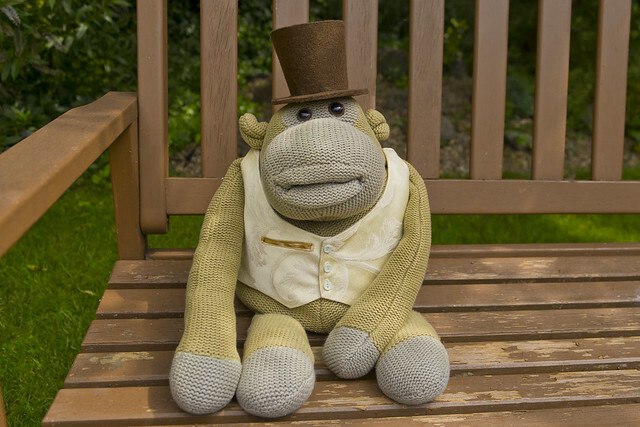 The waistcoat has been cut to fit my particular physique (after all, I am not called ‘Giantmonk’ without good reason!) and is made from a brocade style heavy cotton in cream and ivory. It features a darker gold satin back and matching pocket lining. The original design did not incorporate a pocket, but then I realised that I absolutely needed a way of carrying around a couple of very special items on the wedding day and needed a place where they would feel safe and secure, so I quickly phoned my tailor and made sure that this was taken into consideration. 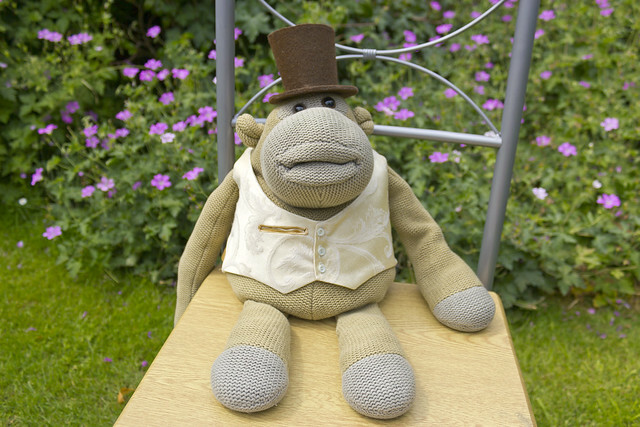 The waistcoat is fastened down the centre with three fine buttons in an ivory colour. 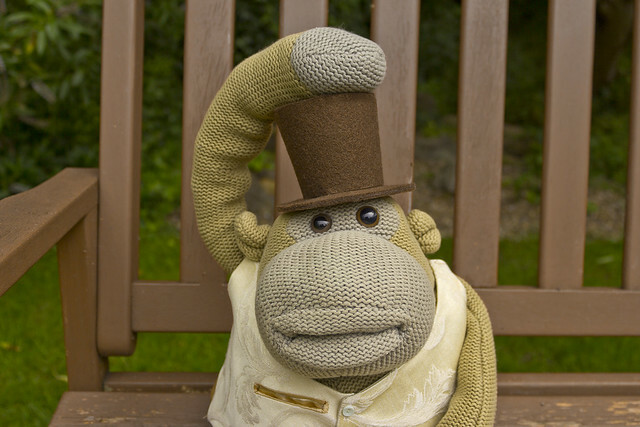 To set the outfit off and to complement such a debonaire monkey as myself I have elected to wear a top hat, which I hope you’ll agree is rather fine and fetching. And good day to you, madam. Such a fine figure I shall cut in this dandy gear that I had to stop the temptation to get a monocle, but I thought this would only highlight the fact that one of my eyes is slightly larger than the other. 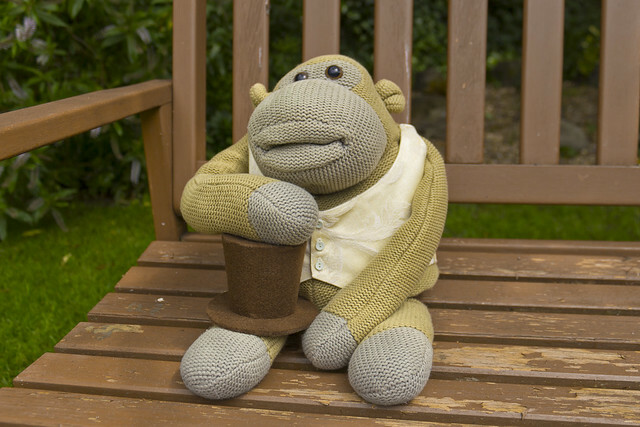 Now all I have to do is wait until I get to wear my top hat and waistcoat for the actual day – I absolutely cannot wait as I never thought that I’d ever be part of something so exciting as a wedding! Giantmonk, what sort of role have you taken on in the planning and execution of Eskimimi’s wedding to Mr. Wonderful? Hello Anne! Let me start by saying that I do so like your hair, it is particularly complementary to your stunning good looks and sets off your features perfectly! As much as I hope that you know I am sincere in all I have just said I hope it also goes to show what a great sense of style that I happen to have been blessed with, as well as a skill in social charm that I have developed over the last two years by talking to so many wonderful people. I have learned by the wit and grace of others, and now continue to do so through my wonderful readers, of whom you are one of my most prized. The gifts of aesthetic appreciation and social ease have led me to my latest and perhaps most important assumed role to date: that of wedding co-ordinator and overseer of all things spectacular. I am sure that you can appreciate that there is so much to organise and beautify for a wedding that it would be simply impossible to cover it all here, but let me indulge you with a sense of the drama I have created for the wardrobe of the wedding party. Now, nobody should outshine the bride, of course, and I am sure that she will look absolutely lovely on the day, but as her outfit is yet to be revealed I have only my own carefully planned and balanced attire to show. This has taken literally months to plan and conceive the perfect understated yet sophisticated and eye-catching outfit so befitting a Giantmonk of my stature and bearing. These are the details from the final design draft, as the actual outfit is currently being hand-woven and sewn by artisans whose ancestors have been weaving and sewing the finest cloth of hundreds of years, but I am sure that these sketches will give you a sense of the magnificent creation for the day. As I said, it is customary that the bride should be the focus of all the guests’ admiring glances and I certainly wish her all of the best hope that this will be the case, but with looks like this and an outfit of this calibre, I will not be able to help it if eyes are drawn towards me whilst I carry out my very special duties as the ring-bearer! 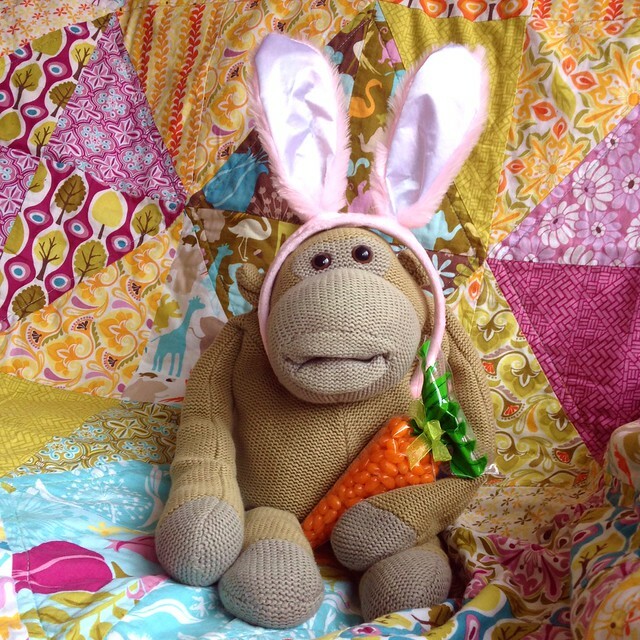 Comment or question for Giantmonk: Do you celebrate Easter and if so what are your plans? Hi Shivaun! Yes, I find myself quite busy around Easter time (hence my slightly late reply. Sometimes I have to step in and help out when the Easter Bunny is slacking, and obviously as a method actor I must always ensure that I am deeply involved in the role. I am entrusted with the distribution of sweet tasty treats at Easter. I cannot pretend that I do not snack along the way… As you can see though, my favourite treat is a nice healthy vegetable. A carrot (made of jellybeans, obviously). 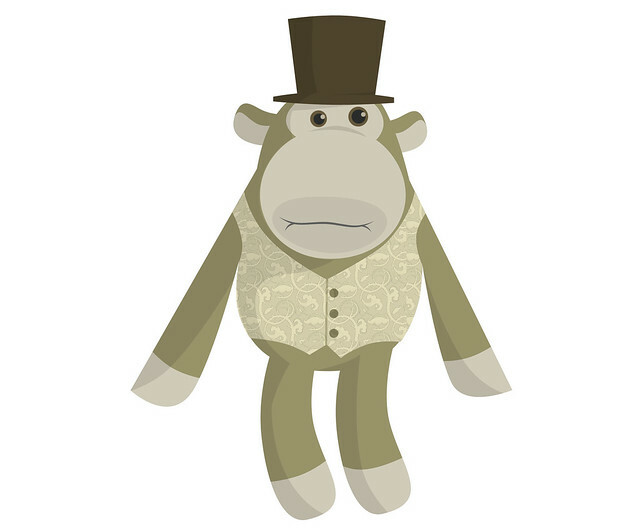 It is a joyous week, for we have a new family member here at Giantmonk Towers – our new friend Midimonk. Midimonk joins us in a not to be ignored sizeable form. 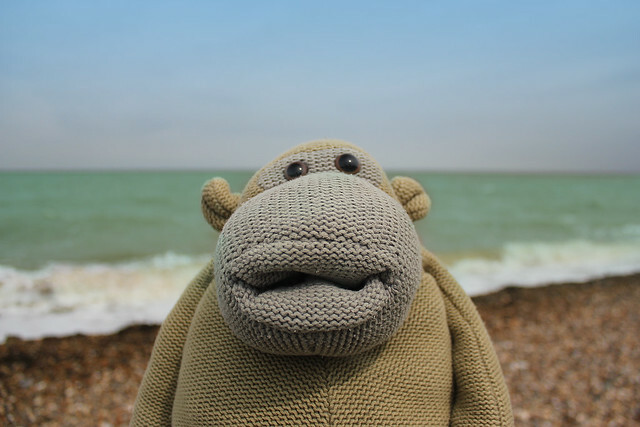 I mean, he is no Giantmonk, as I am indeed a colossal sized monkey, but he is bigger than either of our other two relative monkeys, in what is slowly starting to represent a Matryoshka-like nesting doll family of monkeys; Minimonk and Micromonk. 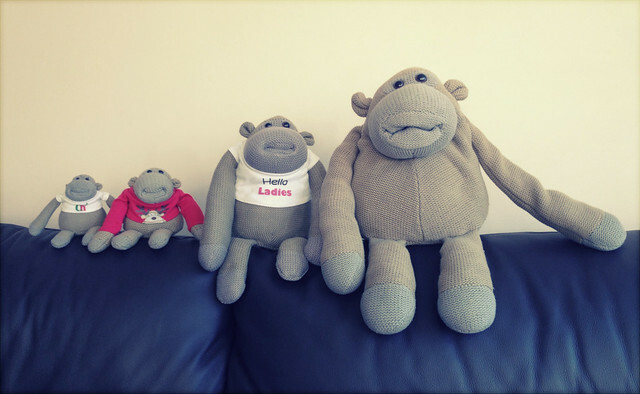 Left – right: Micromonk, Minimonk, Midimonk, Giantmonk. I very much hope that Midimonk will be able to join in many adventures soon, but for now he is just settling in and trying to discover where the jellybeans are stored (mostly in my belly).